A dog costume can be a really fun way for you to bond with your dog. When you dress your dog in a costume, whether it is for a party or simply to go out with friends, you have an automatic talking point that everyone is going to love. The problem is there are so many dog costumes on the market that it can be really difficult to narrow it down to a few choices – not to mention a single one. That’s why we have come up with some of the most important things to consider when it comes to choosing a dog costume and some of the most popular categories of costumes for you to choose from. We will also review five of the top dog costumes currently on the market. Let’s take a look at the top five dog costumes that are currently out there. These five may not fit every dog, but they should fit most breeds like Golden Retrievers, Beagles, Rottweilers, Doberman Pinschers and Siberian Huskies. They may even fit extremely large dogs like Great Danes or very small dogs like Yorkshire Terriers and Poodles. You will have to look at the actual size and fitting to determine whether they will work for your dog. The first of the top five is this lion mane from Furryfido. 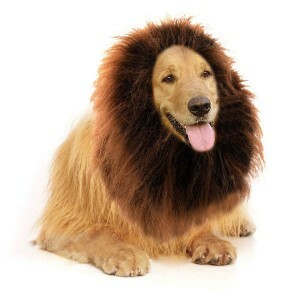 This is the perfect dog costume for medium or large dogs, because it instantly transforms your dog from a regular canine into a ferocious lion. Everyone will do a double take when they see you walking down the street with a lion on a leash. Depending upon your dog’s coloring, it would be easy to mistake them for real lion at a distance. That makes it perfect for Halloween, as well as going out to parties or even a night on the town for you and your dog. The beauty of this dog costume is that it is completely adjustable and will fit dogs from 60 pounds all the way up to 160 pounds. This will depend upon the size of their head, but that weight description accurately reflects most of the dogs out there that fit between those parameters. The mane itself comes with a 14-inch to 31-inch neck girth with the 10 millimeter wide adjustable elastic drawstring. This means that it will easily fit over your dog’s head and sit there snugly. This dog costume also comes with a lion’s tail that will fit any dog. There are a bunch of features that make this really great among the dog costumes on the market. The first is that this dog costume is washable. All you have to do is submerge it in soapy water and scrub it a little and then hang it to dry. You don’t want to put it in the washing machine, but you can get it clean enough with soap and water. It is also made of materials that are gentle and do not cause your dog any discomfort or create an allergic reaction. This is a terrific dog costume for parties, carnivals, dog shows, photoshoots and much more. It even comes with a 100 percent satisfaction guarantee so if you do not like the costume or you need to return it for any reason such as not fitting, then you are able to do it without any hassle whatsoever. Scheppend Adidog is a great place to find clothes for your dog. Just like choosing a dog crate, dog bed or dog playpen, you want your dog clothes to fit your particular dog. If you get a dog house that is to large, then your dog is not going to feel secure. If you get it too small, then it is not going to fit your dog. It is the same way with dog costumes like these dog clothes from the Adidog brand. Clothes that are too big are going to fall off or get stepped on, while clothes that are too small are going to be restrictive and not comfortable for your dog. Luckily, these dog clothes come in lots of different sizes so you are sure to find the perfect fit. 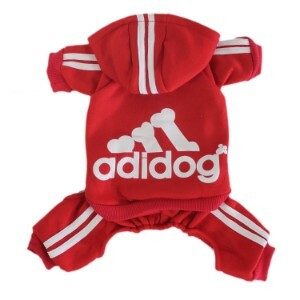 If you have Adidas clothes that you can wear when you go out with your dog, especially if they’re the same color, then you are going to really turn some heads because these dog he clothes look just like the Adidas clothes that you wear. These dog costumes come in six different sizes starting in small, and then advancing to medium, large, extra-large, 2X and 3X. However, there are also multiple styles and colors. The colors available include black, green, gray, blue, red, orange, pink, white and yellow. Although this hoodie and sweatpants is in the traditional dog costume style, like some of the other ones that are reviewed here, it is definitely something cute you can put your dog in and will end up being a talking point for your friends and family members. No matter what kind of social event you are going to, you always get a second look and some conversation when you dress your dog up in these clothes. This is a terrific choice when it comes to choosing a costume for your dog because it is so versatile and goes with so many different things that you probably own. Superheroes and supervillains are one of the most popular topics when it comes to dog costumes. With the massive geek movement, more and more people are getting into comic books and learning about superheroes from the uber-popular movies that are in theaters and on cable television stations. DC is one of the comic book powerhouses, responsible for superheroes like Batman and Superman. Now, you can get your dog outfitted in just the right superhero or supervillian costume to go to your next watch party with friends. DC has a huge universe to choose from, so you should be able to find a terrific superhero idea for your dog. One of the best places to get your pet superhero costume is Rubie’s Costumes. This particular costume is Wonder Woman; something that may work well for your dog, especially if you are dressing up in the same costume or are going is another DC character. This particular costume shop has a bunch of DC characters; mostly superheroes but a few supervillians as well. Some of the choices that you have include the aforementioned Wonder Woman, Superman, the original 60s Batman, Batgirl and Robin from the same television show, Green Lantern, the Joker and the Flash. What is great about these dog costumes is that they fit really well, come in several different sizes that will work for very small dogs all the way up to the medium-large dogs and they are officially licensed so they have all of the actual logos, with costumes that are very close replicas to the originals with the only real differences being that they have been designed to fit on your dog. These costumes are also surprisingly inexpensive, and so you can get several of them for your dog and choose from them whenever you go to a party or event. Pirates of the Caribbean is one of the most successful movie franchises out there, and this costume celebrates that franchise with a pirate costume specifically for your dog. 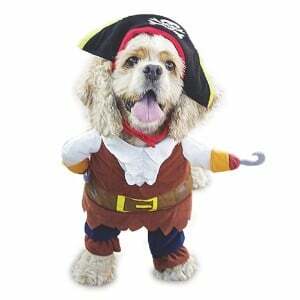 The pirate costume consent consists of a skull and cross bones hat, and a belted full pirate costume for the front of your dog complete with padded arms that makes it look like your pet is walking around on two legs. It is one of the most innovative pirate costumes out there, and everyone will be doing a double take when they see your dog trotting towards them. This pirate costume comes in small, medium, large and extra-small. It is specifically intended for very small dogs, all the way up to the low end of the spectrum for medium dogs. It can work with cooling pads for dogs or fit over cooling vests for dogs, as well as work around collar attachments such as a GPS tracker for dogs or dog activity monitors. How this dog costume looks on your individual dog will depend upon the breed that you have and the size. For poodles and the like, this is the perfect costume, but you probably want to take a look at some of the breeds that are shown in the promotional material or take a look at customer reviews about how the costume fit a specific breed before you buy. No matter what though, the price is low enough that this is worth the investment if you think it will work on your dog, and it is one of the cutest costumes out there. Whether you are dressing up for International Pirate Day, you’re going to a costume party or you’re taking your dog to a watch party of the Pirates of the Caribbean films, he or she will fit right in with all the other pirates there. The only real disadvantage with this costume is that you can only see it when you’re facing the dog. If you look from the side or from the back, you’re going to see almost none of the costume and you won’t fully get it unless you look at your dog facing him or her. Star Wars is another popular franchise, perhaps the most popular science fiction franchise ever created, and there are tons of options out there for dressing your dog in a Star Wars costume. But this one is one of the cutest, and it is going to fit lots of different dogs. This is another terrific entry from Rubie’s Costume Company, one of the most well-known and well-liked costume shops on the web. This is a terrific Star Wars costume, allowing your dog to fight on the side of the Rebellion and use the Force. That’s because this is a classic Jedi robe. To be fair, the uninitiated might think that your dog is dressed as a Ewok, but this costume is easily identifiable as a robe worn by Jedi Knights in the original Star Wars trilogy. 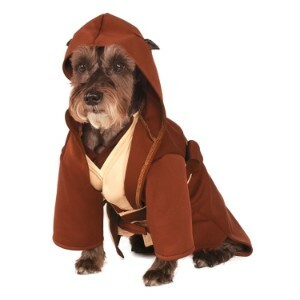 There is the classic hood, the overlapping lapels and the thick Jedi belt that has a pouch for your dog’s lightsaber. The color is a deep brown, and the costume covers almost your entire dog; save for his or her face. You probably do not want to put this costume on an extremely warm weather, because your dog is already going to be hot from being out in the sun with their fur, but this costume is perfect for chilly nights. This is an extremely high quality costume that matches the color of the movies exactly, and is made out of durable material that will last through multiple wearings. What is surprising about all of that is that the price is so reasonable. When it comes to Star Wars costumes, this one comes from one of the best brands in the business, but you do want to make sure that it will fit your pet. Luckily it is adjustable, and Rubie’s offers other Star Wars costumes and accessories like Princess Leia, Han Solo, Chewbacca, Darth Vader, Boba Fett, Obi-Wan, R2-D2 and Yoda. Buying the right dog customer requires that you know what will look good with your dog, there are lots of accessories that you can get your dog including automatic fetch machines, a dog ramp, an electronic dog door, a dog bowl or automatic dog feeder, and outdoor dog kennel for exercise or even an indestructible dog bed. In truth, getting them a costume may not be the number one thing on their wish list, but they will get a great deal of joy from seeing how much you love their costume, and how you match them with a costume, as well as all the attention that they are going to get from everyone sees them in their costume and wants to pet them and give them kisses. The only thing you need to be worried about when it comes to buying a dog costume is making sure that it fits properly, that it is not going to impede them in any way, such as restricting their eyesight, tying down their tail so they cannot use it, blocking their ears so they cannot hear or restricting their breathing. You also want to make sure that it fits. A costume that is too loose is going to make it difficult to move all costume that is too tight is going to be uncomfortable. In addition, be aware of the temperature, and do not put them in a costume that is going to raise their body temperature even higher in warm weather. Now let’s take a look at some of the costumes that you can choose for your dog from the various categories that are out there. When it comes to TV and movie franchises, there are no limits on the number of costumes that you can find for your dog. In fact, the restrictions are going to be what actually looks good on your dog and what is available in your dog size. But putting those restrictions aside for now, there are plenty of TV and movie costumes out there to choose from. There are the latest kids movies, and some of the classics as well, plus franchises that you love such as Star Wars, Star Trek, the Wizard of Oz, Beetlejuice, and the Flintstones, just to name a few. The thing that is great about TV and movie costumes is that there are so many out there to choose from, and there are costumes available for both pets and owners. If you have a favorite movie or television show, and it is widely known and loved, then you can be sure that there is probably a costume out there for it – both for humans and for dogs. People love dressing up their dogs, and with the geek movement these days, cosplay is more popular than ever and that includes pets. In order to find these costumes, the best way to search for them is to look for a particular costume that fits your particular breed. You can find costumes that are adjustable or come in various sizes, but the fact is that dogs are such different shapes from one breed to another, that it is best to find a few costumes that fit that particular breed and fits your dog at his or her current age. Within this category, there are so many different costumes to choose from that this is very easy to do. 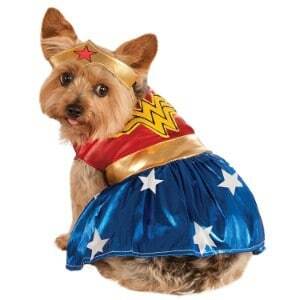 Superhero costumes are another type of costume that you should consider for your dog. Lots of people love superheroes, and there are tons of them to choose from. If you are a comic book aficionado, and you literally have thousands out there to choose from, assuming that you can find a costume for them. However, if you just like the superheroes that you see on the big screen or starring your favorite television show was, then you are in luck because those are going to be the ones that are offered in both human form and dog form when it comes to costumes. The fact is, superheroes are big business these days, and that makes certain that the costume making industry is going to be pumping out costumes for you and your dog. The two big comic power houses that create the world’s most-loved superheroes are Marvel Comics and DC Comics. These two comic book publishers and production companies are responsible for Spider-Man, Superman, Batman, the Green Lantern, the Flash, Iron Man, the Incredible Hulk, the rest of the Avengers and many more. Superheroes come from both the Marvel and the DC side, and if you have seen a movie about them recently or they have their own television show like Supergirl or Arrow, then you will probably find a costume for your dog. One thing that you want to keep in mind when it comes to superhero costumes is that they sometimes come with capes. This can be a little difficult to manage, because not every dog takes to a cape. The cape needs to be out-of-the-way and unobtrusive, without the propensity to slip down and get in their way when they try to walk. Unfortunately, some superhero costume simply are not complete without a cape, but if your cape does impede your dog’s movement, make sure you pin it up or keep it out of the way somehow. You can find some really hilarious costumes for your dog in the humor category. The problem is, many of these dog costumes are a bit too oversized or comprehensive for your dog to wear them for more than the length of time it takes to do a photoshoot. The more elements that a costume can incorporate, the funnier it is, and that’s why putting a horse costume on your dog with an attached cowboy that rides on top is hilarious to look at, but not very practical because the cowboy is going to fall down very quickly and then get dragged around the ground. But luckily, there are lots of hilarious ideas out there, and some of them can be taken to a party or be used for a couple of hours without a problem. Just a few of the funniest costumes out there that you can use for photo shoots include your dog dressed as a band though with the sand person on top, your dog dressed as a UPS delivery man complete with arms holding a box, your dog dressed as Elvis with guitar, your dog dressed as the three-headed dog Fluffy from Harry Potter, your dog with six extra legs making him into a spider, your dog in a costume that incorporates another dog walking on hind legs with a package in between them, or even your dog dressed in a full Ewok costume from Star Wars. There are tons of great ideas out there, but the best ones are not going to last for very long, so you want to use them mostly for photoshoots. Of course, there are a few hilarious costumes out there for walking around in as well. Some clever ideas include attaching an oversized, Styrofoam beanie baby tag to your dog to make him seem like one, attaching costumes with funny signs or fake hands on your dog or various other witty ideas. The main thing is to find something that actually fits your dog that you find funny. What about dressing your dog like another animal? There are plenty of costumes out there to help your dog dress up like a totally different animal. One of the more popular ones is a cat costume. Having a dog dressed up as a cat can be really funny, as can the opposite. But there are other animals as well. One of the things that you may not have considered is that you can do a great deal with spray paint. Spray paint that is safe and washable can be used to turn your dog into a tiger, lion, giraffe or many other animals. You do have to have a little bit of talent at painting in order to make this happen, but the result can be well worth it because the paint will last for many hours. But there are other animal costumes as well. Sometimes all you need is a couple of accessories in order to make this happen. There are full-fledged costumes out there for animals, but some of them have several different pieces, and they should only be used temporarily for photo shoots. Typically, the fewer pieces that a costume has for your dog, the longer it is going to be able to stay on them without problems. Sometimes, just adding different ears and a bodysuit that mimics an animal’s markings can make all the difference. You could also go with insect costumes. Insect costumes can be pretty funny and clever as well. One example is dressing your dog like a centipede or millipedes with lots of extra legs dangling off of the costume. You have to make sure that they do not impede movement, but for dogs with elongated backs, this can be a really effective and creative costume. If you are a sports fan, then dressing your dog up in the colors or logos or your favorite team is certainly an option when it comes to going to Halloween parties, doing photoshoots and participating in other activities and costume parties. Your whole family and your pets can be outfitted in matching sports jerseys to go to a game, or you can use spray paint that washes off and is safe for getting decked out in team colors. Depending upon the sport, there are lots of options out there when it comes to full costumes and jerseys that your dog can wear. Football is an extremely popular sport when it comes to costumes, but you can find basketball and baseball costumes as well. However, you don’t have to wait for a costume party or special event to deck your dog out in your favorite sports memorabilia. The fact is, you can start accessorizing with your dog right away. You can get dog collars that are already printed with your team logo and colors, leashes that have the same, dog vests, dog beds and much more. In fact, if you look for them, you can probably find most of the accessories that you buy for your dog anyway already printed with your favorite football or baseball team. There is just a ton of sports memorabilia for dogs available. There are other sports related costumes that you can get for your dog as well. For example, instead of getting an actual team jersey or collars or leashes that are printed with your team logo, consider getting your dog something related to sports such as making them look like a football, or dressing them up as a cheerleader. There are lots of ideas out there when it comes to sports, because lots of people love sports as much is they love superheroes, and the market is wide open. Halloween is the perfect day for dressing your dog up in costume, as well as putting on your own costume, because there are so many opportunities to show your costumes off. If you have kids, you can take them trick-or-treating, or you can go to Halloween parties that allow pets, as well as visit stores that allow pets. Halloween is a great opportunity to go out and show off your amazing costumes. But what do you choose for a dog Halloween costume? Luckily, there are tons of choices out there, including many that we have already discussed. When it comes to Halloween costumes for your dog, what you really want to keep in mind is that whether you are talking about a dog skunk costume, a dog skeleton costume or whatever unique dog costumes you come up with, you want it to be something that complements your own costume. For example, someone that is going as a cowboy may want to dress up their dog as a horse. Someone going into space costume may want to dress their dog up as a spaceship. Some of the movie franchises we’ve already discussed have great opportunities for pairing costumes. A Jedi Knight and a Yoda are a great pair, a Bantha and a Sand Person are terrific costume combinations or a Klingon from Star Trek and a Targ are winning pairings. There are lots of ideas out there when it comes to holding costume at the people are going to notice, and luckily, Halloween is when everyone started stacking up on costumes, so you can potentially get costumes for the rest of the year for you and your dog, although you may have to pay little more for them. Finally, holiday costumes are the last type of costumes that will be talking about. Holiday costumes are terrific costumes for dogs as well, because usually you go to someone’s house to celebrate the holidays – perhaps even your own house – and you have lots of friends and family members around that can appreciate a dog costume. One of the most popular ways to dress your dog up for the holidays is to put an elf costume on him or her. There are lots of variations on this popular costume, so you are sure to find something that fits your particular breed and size. You could also address your dog up as a Christmas present, or as one of the trending costumes for holidays where the front half of your dog appears to be an elf walking along on two legs holding a present with another elf holding the same present on the other side. Another classic dog costume is to dress your puppy up like Santa Claus. There are tons of different holiday ideas out there, not just for Christmas but for all kinds of holidays all across the world. You can dress your dog up to celebrate Hanukkah with a Menorah costume, turn them into a reindeer to celebrate Christmas or whatever your particular celebration and religious beliefs allow. The bottom line is that there are tons of costume ideas out there for you and your dog. If you want to dress your dog up for the holidays, for attending a sports event, going to a costume party or a cosplay event there are so many options out there that you would be hard-pressed not to find something that you will absolutely love. What is great about putting your dog into a costume is that you are able to put on your own costume and be a matching pair. Of course, it all comes down to choosing the right costume. Hopefully, this buying guide has been able to give you some great ideas on what kind of costumes are out there and how you can come up with your own ideas based upon what you are going for. If you are looking for something humorous, there are lots of funny costumes out there, or you might be looking for something to celebrate a particular event like dressing your dog up in a Harry Potter costume to go to a Harry Potter watch party. Whatever your goal is, your dog will love the attention that he or she gets in there costume and you will love showing him off to your friends.